I am facing a birthday in a few weeks at which time I will be 86 years old. Old age kind of sneaks up on you, especially if you ignore the seconds, minutes and hours that march by because you are living and enjoying life. Age is a tricky thing, but some people get old because they enjoy what they do. 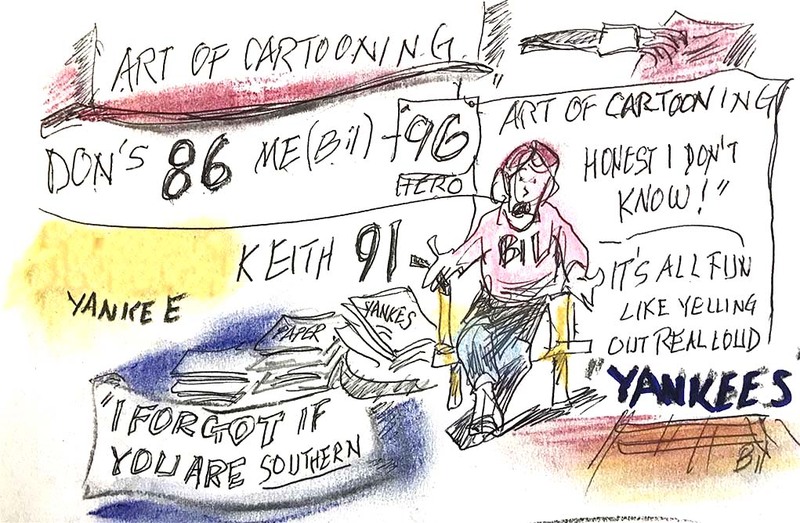 Take our legendary cartoonist, Bil Canfield, who, at 96, is still creating cartoons every week for Sonoran News. Canfield had just retired after 50 years with the New Jersey State Ledger. We have a full page article from the ledger where they sang his praises. He joined the Ledger after he spent WWII on a battleship as a boatswain mate. Canfield still joins his shipmates frequently. He also goes to art class and art events. He has never really slowed down. Come to our office and see the ledger rendition of his 50 years, which also includes his wide expanse of the art of cartoons. Then there is my best friend Marine Colonel Blaine Keith. We have written about his incredible life many times. He learned to fly in his early teens and enlisted in the Marines at age 17. After a short military training he was assigned to fly with the also legendary Joe Foss in Guadalcanal. He continued to fly through various islands ending at Okinawa. He was expecting to support the invasion of Japan when President Truman dropped two atomic bombs, ending WWII. Keith went to War College and was later recalled to fly 100 missions in the Korean Police action where earned a Silver Star and Purple Heart. Keith became a test pilot and later worked at NASA and was a leader in the space programs. He later was a corporate leader for the Western Region of Goodyear. I met Keith when he retired in 1990, moved to Carefree, built a house and became active with Kiwanis, Desert Hills Presbyterian Church and the Masons. He visited many schools and spoke mostly about the space program. Today at age 91, he goes to Bible school on Saturdays, church on Sundays and Kiwanis when weather and health permit. His mind is still as sharp as he when he was a young man. While I was living in Florida there was a nearby hunting club. It had 24 members and someone had to die to open an opportunity for a new member. The club consisted of four camps with six members in each with a roofed kitchen equipped with a propane refrigerator and stoves. There were places to park our jeeps and trailers. My albatross was I was a dreaded Yankee. Most of the members were all southern, with a capital S. Through a friend I met Jimmy Holmes, a local insurance agent who headed James E. Holmes Medical Center. He was highly regarded and offered to speak for me but I would have to be interviewed by the 23 members of the club. I met them all, individually, and they were all convinced I left Illinois to integrate the schools and everything else. I moved there in 1960 and the entire area was segregated – drinking fountains, most restaurants, churches and there was an area, South Melbourne, where blacks lived. I joined Radiation Inc., primarily a government contractor, so segregation was not allowed. All of the inspectors who came to overview our contracts were black. They forced employees to go to lunch at the local golf course, which Radiation officers informed it had to allow the event. One place after another felt the demands of feds and integrated, but you can see why I was suspect. Although I got a unanimous vote, they all made it clear it was Holmes who demanded they vote for me. The hunt camp is another story but I’ll go there later. The point is only three men are alive who were in our six man group, Dr. Frank Fain, who is my age, David Strawn, and me. David is a lawyer and was once appointed as the local sheriff. Jim Sewell (who left an opening when he switched to a different camp), Holmes, Bud Stewart and Andy Seminick, the famous whiz kid who caught for the Phillies and Cincinnati, rounded out the group. That hunt camp was heaven on earth, not just because of abundant game and fish, but the camp members were great people. If the civil war was now, I would be on the side of the south, not because of slavery, but because of state rights.